This study was carried out in support to the studies and research activities on the monitoring of natural disasters conducted by CNES: improvement of techniques and tools, evaluation of the SAR capabilities, and of its merging capability with optical data sources for the monitoring of natural hazards and of the temporal variations of the surface state in areas affected by a natural disasters. The study area was the region of Izmit (Turkey), which suffered badly from the earthquake of August 17, 1999. 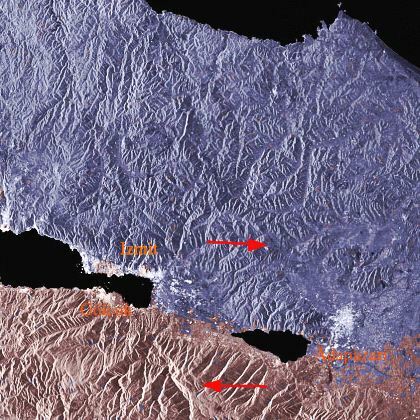 The data made available by CNES were 4 ERS SLC SAR images: 1 interferometric couple acquired before the earthquake, and 1 interferometric couple acquired in September 1999. In this project, ParBleu's team was in charge of the demonstration of SAR correlation capabilities to detect the movement of a tectonic fault (the North Anatolian fault) and of the evaluation of material damages within urban areas using ERS SAR data ((tm)DYNAMIC-RADAR products). Superimposition of the 12/13 August ERS images (in red) and the 16/17 September ERS images (in green/blue). Using ERS orbital parameters to ensure the best possible accuracy a spatial resolution of 20x20 meters is obtained. September images (blue) are displaced towards right in the upper part of the scene towards left in the lower part of the scene. August images (red) are displaced towards left in the upper part of the scene towards right in the lower part of the scene. These displacements represent the displacement of the geological fault during the earthquake. Copyright 1996-2006 by ParBleu Technologies Inc - Privateers N.V. Readers may redistribute this homepage and its locally linked pages to other individuals or institutions for noncommercial use, provided that the text, all html codes, and this notice remain intact and unaltered in any way. No component of this homepage and of its locally linked pages may be resold, reprinted, or redistributed for compensation of any kind without prior written permission from ParBleu Technologies Inc.